Women have struggled since the beginning of time. In a culture bound by oppression, women struggle for a chance to acquire the same fame, influence and success of that of a man. However, where there is oppression, there is resistance! Just like the girls from our soon to be released “Saudi Girls Revolution” comic book & video game, we find women who soared the heights of success and who thrived and triumphed against all odds. Below are five examples of women who deserve more visibility and support to the cause to which they have made their lives’ work. We understand there are many outstanding Arabic women and we cannot mention them all in today’s article, but we welcome your comments and encourage you to share other suggestions with us. Dr. Hayat Sindi is a medical scientist from Saudi Arabia and one of the first female members of the Consultative Assembly of Saudi Arabia. She is famous for making major contributions to the development of point-of-care medical testing and biotechnology. Dr Hayat Sindi is ranked by “Arabian Business” as the 19th most influential Arab in the world and the ninth most influential Arab woman. Dr. Sindi was the first Saudi woman to be accepted at Cambridge University in the field of biotechnology, and the first woman from the gulf to complete a doctoral degree in the field. Dr. Hayat Sindi was appointed by UNESCO as a Goodwill Ambassador for her efforts in promoting science education for girls in the Middle East. Her main focus today is on empowering the next generation of inventors and entrepreneurs in the Middle East through her “i2 Institute for Imagination and Ingenuity”. Sheikha Lubna Al Qasimi is the UAE’s first female minister. She was appointed to her first ministerial post in November 2004 — becoming the Minister of Economy and Planning, before taking the Minister of Foreign Trade brief afterwards. In 2013, she was appointed the Minister for International Cooperation and Development (MICAD). Sheikha Lubna Al Qasimi has accomplished several personal and professional achievements. Sheikha is listed as the 42nd most powerful woman in the world by Forbes. She is also Number one for the fifth year in a row in Arabian Business’ “100 Most Powerful Arab Women” list in 2015. In 1999, she was appointed as Chief Executive of “Tejari”, which is funded by HH Sheikh Mohammed Bin Rashid Al Maktoum, ruler of Dubai, and prime minister of the UAE. “Tejari” has become the first Middle Eastern business-to-business marketplace, which is now one of Dubai World’s most successful units with franchises across all the Middle East. Dr. Amal Al-Qubaisi made history becoming the first woman in the Arab world to be the president of a national council. Thus, she is the first woman in the Arab world to hold the highest parliamentary position. This is not the first time that she has made history, however. Dr. Al-Qubaisi was the first woman to be elected to the FNC in 2006, the first woman to become its deputy speaker in 2011 and the first woman to chair one of its meeting in 2013. Dr. Al-Qubaisi also works with UNESCO on the documentation and preservation of some of the UAE’s most significant heritage sites. Finally, Al-Qubaisi made it to the number seven spot of Arabian Business’ “100 Most Powerful Arab Women” list in 2013. She will certainly continue to serve as an inspiration for all Arab women. Born in Tunisia in 800, Fatima Al-Fihri is recognized as the founder of the oldest University in the world, still standing today. “The Al-Qarawiyyin Mosque and University” was established in Fez, Morocco in 859 CE, becoming the most important cultural and intellectual bridge between Muslim and European cultures. Many of the scholars of Qarawiyyin became great scientists such as Ibn Khaldun. Al-Qarawiyyin has become one of the leading spiritual and educational centers of the historic Muslim world. This is not only an example of how education and religion merge, but it defines the valued role that women played in the Islamic community – an aspect of Islam that is often misunderstood. Zainab Salbi is well known for excelling as an Iraqi-American humanitarian, women’s rights activist, author, social entrepreneur, and media commentator. By the age of 23, she founded “Women for Women International,” a grassroots humanitarian and development organization dedicated to serving women survivors of war. According to “Arabian Business” 2015, Salbi is one of the top 100 Most Powerful Arab Women. 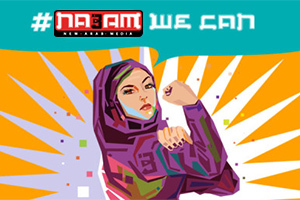 She is currently developing multimedia platforms focused on giving a voice to Arab and Muslim women. These brave women are just some of the many examples out there of women with a remarkable story, leaving a long lasting impact on society. They are an example to follow for their role and contribution to the world’s culture and well-being in their related fields.